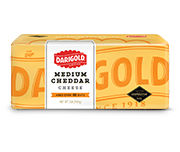 Toggle FAQ How is Darigold's natural cheddar made? Darigold’s natural cheddar is hand-selected and crafted by its master cheese maker in Darigold’s Sunnyside, Washington plant with farm-fresh milk that’s produced near the plant. 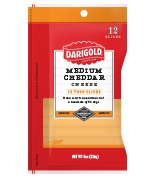 Darigold uses a five-step process that sets its cheddar cheese apart from other cheddar cheeses. Be sure to check out "About Cheddar" on this site for more information. Toggle FAQ What forms is the cheese available in? Darigold’s naturally white cheddar is available in four forms: wedges, blocks, slices and convenient shreds. The wedges are a perfect addition to an artisan cheese plate. Toggle FAQ What kind of rennet is used to make Darigold Natural Cheddar? Darigold uses a microbial based enzyme to make our cheddar. The enzyme coagulates the milk, which is then cut into curds and whey. 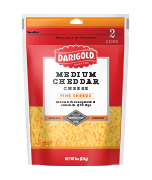 Toggle FAQ What makes Darigold's cheddar different from other cheddars on the market? Darigold's natural cheddar is hand-selected and crafted by Darigold’s cheese maker. Each batch is taste-tested to ensure it’s reached the right sharpness and flavor profile. It's free of artificial colors, making it naturally delicious. Toggle FAQ Where can I buy the cheese? 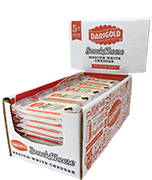 Darigold Cheese is available at most fine retailers in the Pacific Northwest. Toggle FAQ Where is the cheese made? The cheese is made by Darigold’s master cheese maker at Darigold’s Sunnyside, Washington plant with quality milk that’s produced near the plant. Haven’t found the answer in our resources?